Six former Miamians made their NHL debuts in 2016-17, bringing the total number of ex-RedHawks to play in the world’s best hockey league to 33. Scoring their first NHL goals were rookies Austin Czarnik and Blake Coleman, who became the 18th and 19th players to hit the net in that league after playing their collegiate hockey in Oxford. Miamians have logged a total of 5,831 NHL games, tallying 798 goals and accounting for 2,205 points. FIRST LOOKS: Dressing in their first NHL games this season were Czarnik, Coleman, Riley Barber, Sean Kuraly, Pat Cannone and Jack Roslovic. Czarnik had the best rookie year from a points perspective, scoring five times and dishing for eight assists for 13 points in 49 games for the Boston Bruins. Coleman played in 23 games for the New Jersey Devils, finishing 1-1-2 in 23 games. Kuraly picked up a lone assist in eight games with Boston, but he scored twice in the same game in the Stanley Cup playoffs, the tying goal with under three minutes left in the third period and the overtime game winner in a 3-2 win over Ottawa. Cannone (Minnesota) debuted at the age of 30, and both he and Barber (Washington) logged three games without a point, while Roslovic (Winnipeg) took the ice for one game and was held off the scoresheet. 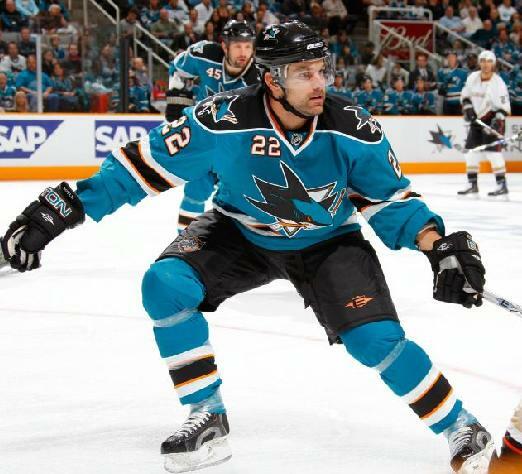 Dan Boyle (BoB file photo). CALLING IT A CAREER: Dan Boyle called it quits prior to the season, ending his career with 1,093 games played, 163 goals and 442 assists for 605 points. He is tops all time among ex-Miamians in games, helpers and points and is second only to Brian Savage in markers. SCORING LEADER: Los Angeles D Alec Martinez was tops among former RedHawks in NHL scoring with 39 points, including nine goals. F Reilly Smith was No. 1 in goals, scoring 15 times for Florida. PLAYOFFS? PLAYOFFS?!?! While 13 players who spent time in Oxford logged NHL games in 2016-17, only three participated in the Stanley Cup playoffs: Kuraly, Tommy Wingels and Chris Wideman. Kuraly scored two goals in four games, including a game-tying goal and an OT winner. Wideman made his NHL postseason debut, and notched a goal and three assists in 15 contests. Wingels dressed for nine games but did not tally a point. Wideman and Wingels both played for the Ottawa Senators. Ottawa eliminated Boston in the first round before being knocked off in the conference final. Tommy Wingels (BoB file photo). HEADING TO CANADA: Wingels was traded to Ottawa mid-season and rolled up four points including two goals in 36 games after his move. He had eight points (5-3-8) in 37 games with San Jose, but that team was bounced in the first round of the playoffs. IRON MAN: For the fourth straight season, Smith played in at least 80 games. He dressed for exactly 80 in 2016-17, which actually represented a four-year low for the forward. He has also recorded at least 20 assists and 35 points in each season during that span. MILESTONES: Andy Greene moved into second place on the all-time games-played list by former Miamians, and dressed for the 700th time in his career, all with New Jersey. He also earned his 150th career assist in 2016-17. Martinez moved into sixth in games played, eclipsing the 400 mark, and passed Kevyn Adams to move into sixth place in career points. Wingels became the sixth former RedHawk to scored 50 NHL goals. He had eight in 2016-17, giving him 53 total. Wingels has now played in 54 postseason contests, fourth-most by a former Miamian. 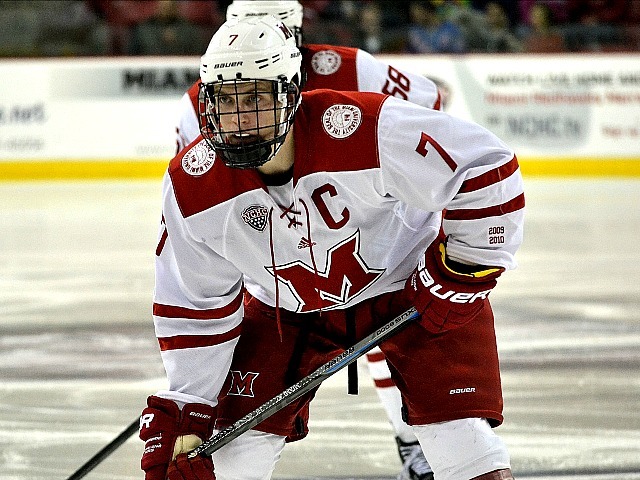 On deck: BoB takes a look at Miamians in the AHL. For the third time in four years, Miami viewed the NCAA Tournament at home following a run of eight consecutive appearances on Division I hockey’s highest stage. It was tough to watch, as this team didn’t compete hard enough, consistently enough to pull itself into PairWise contention, and the reality that the RedHawks would not play long into March began to set in during a miserable February. The program is presently at its lowest point of the Enrico Blasi administration, as its win total last season was Miami’s lowest since 1990-91. True the RedHawks went 0-for-4 in NCAA berths during Blasi’s first four years, but they were trending upward at that point. And now we’re nearly at the midway point of the off-season, three months removed from the tragic end of 2016-17, a little under four months from puck drop. When a program reaches DEFCON 2, everyone has a theory to fix its problems, and emotions can sometimes obscure rational thought. And giving into that mentality is tempting, because of course SOMETHING has to be done. It doesn’t help being close to the situation. Going to a majority of games, watching most of the rest on TV or the internet, knowing many people within the program and their families. From this end, in a way the relationship is somewhat paternal (or maternal for any PC police that may be reading). There’s a love of program that ultimately – eventually – overrides all negatives. A season like last one is tantamount to having your kid get busted by the cops for egging neighborhood houses: You’re mad as hell but that anger only exists because of your superseding love. And that’s largely why three months have elapsed since the last post on this site (to that point: two written and edited stories were scrapped on this end in late March). Blasting hard-working athletes and coaches seems like piling on after a season ends. Everyone reading knows 9-20-7 isn’t an acceptable record for this program. Re-hashing that yet again doesn’t do anyone any good. So it was necessary to take a step back rather than rolling out the hatemobile and taking the urban assault approach. With that out of the way, let’s address the program in an ombudsman-like fashion, answering some of the questions now being tossed out and allow people who didn’t follow this season to catch up. Q: What happened last season? Defenseman Louie Belpedio (photo by Cathy Lachmann). A: A number of issues culminated in a bad year. Injuries to key players, such as captain Louie Belpedio and fellow defenseman Jared Brandt, goalie Ryan Larkin, forwards Carson Meyer and Justin Greenberg, all of whom missed multiple games. The team severely lacked scoring depth beyond its first two lines, and overall the forwards weren’t as strong defensively as in past years. Same with the defensemen, who were not physical enough and frequently out of position, leading to far too many A-plus scoring chances by opponents. And yes, there were 14 freshmen on the team, which didn’t help. The development didn’t happen as quickly for some as has typically been the case at Miami. Q: So if there are all of these freshmen this year, does that mean the program is doomed for several more seasons? A: Let’s hope not. The injuries were (hopefully) an aberration, and only three of the starting 19 graduated (Fs Anthony Louis and Greenberg and D Colin Sullivan). Several of the freshmen got substantially better as the year went on, most notably F Gordie Green. The defense is going to be key next season. Miami scored 2.53 goals per game, which is nowhere near great, but the RedHawks allowed an average of 3.14, which is brutal with such a solid goalie. 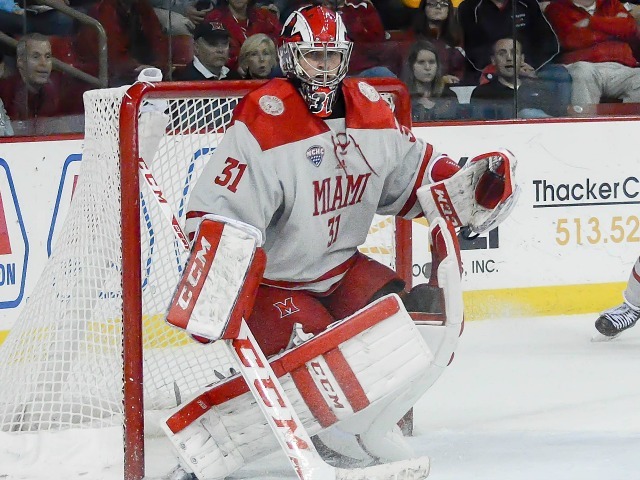 And Miami does have an excellent netminder in Ryan Larkin who was among those freshmen. 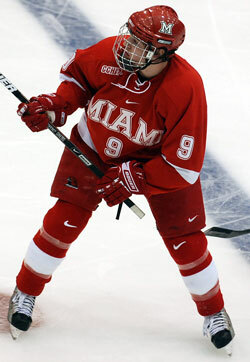 Miami goalie Ryan Larkin (photo by Cathy Lachmann/BoB). Q: Is Miami not getting good enough players or are they not being coached well? A: Gotten this one a couple times, and it’s an excellent question but a really tough one to answer. In college, the coaching staff recruits the players, so either way it falls on the assistants and the head coach. But to answer, it appears to be more on the recruiting end but it’s a little of both. Miami was extremely fortunate to have current Detroit Red Wings coach Jeff Blashill and Bowling Green coach Chris Bergeron as assistants during much of that long NCAA Tournament run, and even after Blashill left, he was coaching USHL Indiana and feeding players like Blake Coleman and Joe Hartman to Oxford. With those coaches no longer associated with the program, the talent pool has not been as strong, and that obviously has a delayed effect, as players that those former coaches guided to Miami remain in college for several years after they sign. Miami has brought in more NAHL players recently, and while some have thrived in Oxford, overall it’s not as strong of a juniors league as the USHL, the top development league for Division I.
Q: So the current coaches are to blame? A: Questions like these deserve very careful response, because we’re talking about people’s livelihoods. People with families and houses and bills. Journalists of all people should be aware of the scrutiny people can face when they’re in the public eye. If a team goes 9-20-7 like Miami just did, it’s there for everyone to see, evaluate and lambaste through social media and other internet sites. On a smaller scale, if a writer types “seive” instead of “sieve”, same thing. So there should be professional courtesy. That said, yeah, it’s absolutely fair is to say the coaching staff hasn’t done a good job during this stretch. Note that it’s not saying that any of these men who undoubtedly love the program and work their hind quarters off to make it successful aren’t doing their best, they don’t care, or they’re bad people. That effort just isn’t culminating into victories. And what’s especially frustrating is that they’ve been given all of the right tools by the university to win. The RedHawks play in a rink that’s the envy of 90 percent of Division I and they had a seven-figure weight room built specifically for them, literally yards from the Cady Arena ice. The school is top-notch, the campus is beautiful, as are the co-eds. Heck, even the weather is fantastic compared to the rest of the NCAA, except Arizona State and Alabama-Huntsville. They also have two well-paid assistants when the standard in college hockey has been one. 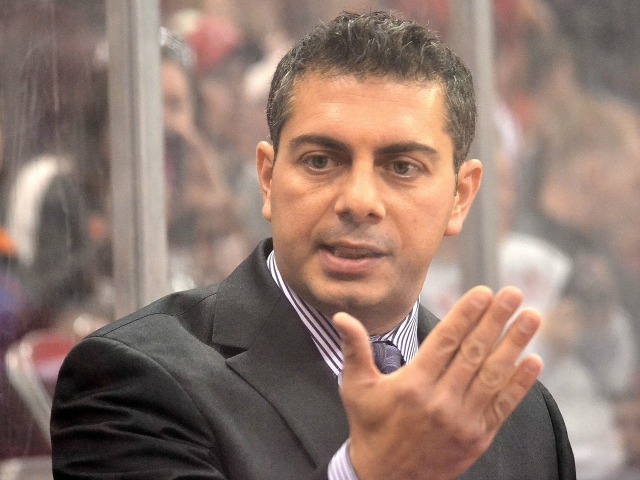 And speaking of pay, head coach Enrico Blasi is one of the highest-compensated college hockey coaches on the planet. The university has basically said, here you go, here’s the keys to the vault and everything you could possibly need to field a winning hockey team. All you need to do is win. And for four years, they haven’t done that nearly enough. Q: Should the coaches get the boot? A: It’s the elephant-on-the-computer-monitor question. First off, Blasi has six years left on a huge contract. So for the people who want him gone, he isn’t going anywhere soon, especially with the recent turmoil surrounding the coaching positions in other sports the past couple of years. And in a what-have-you-done-for-me-lately field, let’s not forget that without Blasi, there would likely be no palace of a rink on the south side of town, no 10 NCAA Tournament banners – including eight in a row – a national championship game appearance and two Frozen Four berths. Like him or not, the guy built this program to elite status. Miami went 11-20-5 the year before he took over, and in his fifth season – the first year all of his players were recruits by his staff – the RedHawks made the NCAAs and would do so eight of the subsequent nine years. He’s also a Miami graduate who has completed 18 years of coaching at his alma mater. He deserves a ton of respect for what he’s done for this program. Now if the titanic struggles continue for several more seasons, his position may be reevaluated. As for the assistants, their positions are probably less stable since they’re largely responsible for recruiting. They’re also pretty well paid for Division I hockey. 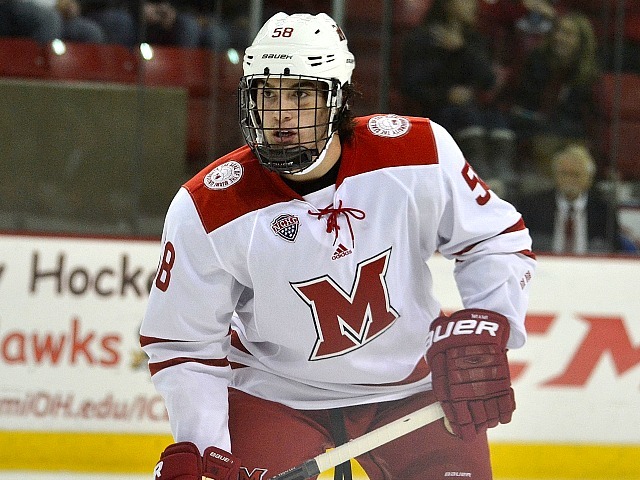 And to be fair to them, Brent Brekke is well-respected for his work with defensemen and Nick Petraglia – another MU alum – has done great work with the goaltenders (TV PxP guy Dave Starman illustrated the improvement in Larkin’s game due to an adjustment Petraglia made in his stance). But it’s very difficult to answer the question as someone who’s not in the locker room every day and rarely sees practices or even a lot of live road games. To call for those jobs from this perspective would be irresponsible. But it’s irrelevant right now anyway. It’s mid-June, and any changes in this area would’ve been addressed months ago. A: So an outside entity is going to evaluate every aspect of the program, which cross-our-fingers will get it back on track. Hopefully the coaches realize what they’ve been doing the past several years isn’t working – a tough thing to accept for choleric leaders accustomed to success – and will hopefully implement suggestions from that analysis. Then the hard part: Everyone from fans, players, coaches, etc., play the waiting game for another four months until Miami’s 2017-18 home opener vs. Providence.